An open source ILS (integrated library system) used by over 1000 libraries around the world. The software, also called Evergreen, is used by libraries to provide their public catalog interface as well as to manage back-of-house operations such as circulation (checkouts and checkins), acquisition of library materials, and (particularly in the case of Evergreen) sharing resources among groups of libraries. Cataloging: to add items to the library’s collection and input information, classifying and indexing those items. 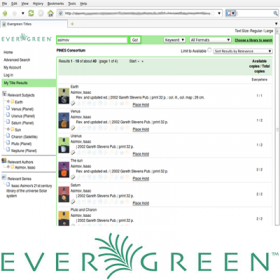 Online public access catalog (OPAC): a public catalog, or discovery interface, for patrons to find and request books, view their account information, and save book information in Evergreen "bookbags." The OPAC received a makeover in early 2009 with the new, optional skin, Craftsman. Acquisitions: for staff to keep track of those materials purchased; invoices, purchase orders, selection lists, etc. Statistical Reporting: flexible, powerful reporting for retrieval of any statistical information stored in the database. SIP 2.0 support: for interaction with computer management software, self-check machines, and other applications.